First a confession. This is not really a blog. It is more of a thought that I am sharing. Kim and I watch all of the films nominated for best picture. I finally saw Django Unchained Thursday night. I only have two more to go (Argo and Amour). Don’t worry, I will post full blogs about the films later, after I have seen all of them just like I did last year. But that is not what I am blogging about today. I will tell you my thoughts about Django later. But for now, I want to tell you what I have decided. I have decided that Django Unchained has the same plot as Star Wars (Episode IV, which to me, will always be just, Star Wars). Obi Wan Kenobi and Luke Skywalker? Do not read any further if you have not seen the film and want to be surprised. Django is Luke Skywalker. He is freed from the shackles holding him back–in Django these are real manacles, for Luke they are metaphors. They both find a mentor–the same one who frees them–a mentor with a white beard and a funny accent (Obi Wan is English, Dr. Schultz is German). The basic plan is to break into the bad guys territory (Plantation=Death Star). Leonardo DiCaprio is Darth Vader. Slavery (The Old South) is identical to the evil Galactic Empire. Princess Leia is tortured. So is Broomhilda. The mentor figure fights the bad guy and dies doing it. There is a final battle. Django blows up the plantation with dynamite. Luke blows up the Death Star with a torpedo. Kerry Washington even looks a little like Princess Leia at the end. When George Lucas made the original Star Wars, he said it was like an old western set in outer space. 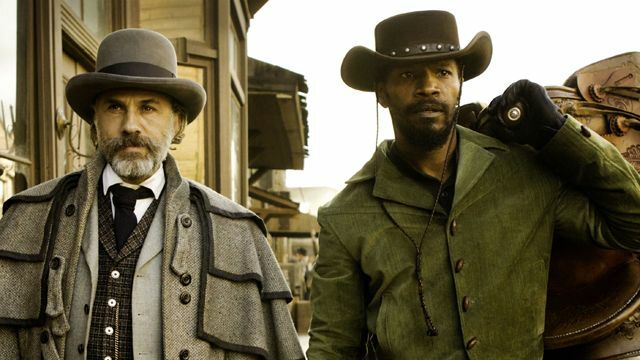 In Django, the outer space story has now become the western. That would have never occur to me, but you may be right. Though I don’t think that Tarantino was looking for inspriation in Star Wars. The plot of Star Wars has become a setting stone for many movies. It is not too complicated, it can happen under many different circumstances and it is appealing to wide audience. I agree, the original Star Wars plot is not rocket science complicated. However, what interests me is how those same basic elements, as you say, are now the formula for most movies–especially those that aspire to be epic. Before Star Wars the plot of most movies was either the lone wolf (bogart, eastwood) or the buddy films with the occasional journey plotline thrown in.. but after star wars, and now with people who grew up on that film, the main plot is mentor/rescue/blow up. and you are equally right in that i in no way think QT intended it or as copycating. And then my fifteen year old daughter comes in and says, “But of course, it’s the Hero’s Journey”. I’m glad she’s around to explain this stuff to me…. your daughter is wise beyond her years, and you are even wiser for having taught her such wonderful concepts!